I worked this up for this week's Crafty Secrets challenge over at Splitcoast, themed "beyond the fold." By beyond the fold, they mean that you can stamp, embellish or otherwise decorate your card beyond the card front. 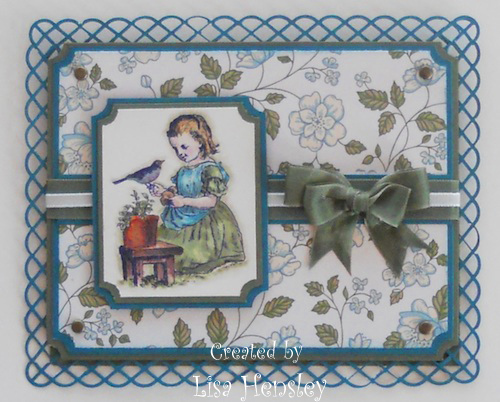 I chose to create a punched border around the outside of the standard sized card front. Because I don't have any Not Quite Navy ribbon, I substituted a piece of Not Quite Navy card stock under the Always Artichoke seam binding. Jeepers, Lisa, can you teach me to color like you do?? I've never seen these cards on SCS - probably because I look at only SUO! They're GORGEOUS!!! Only 5 more weeks til our Summer Mini preorder - am I sounding excited, or what? ?